94% of businesses affected by a big data loss experience bankruptcy. The solution is a business continuity plan. 70% of businesses that suffer a large data loss go out of business within a year. 94% of companies affected by a big data loss declare bankruptcy. 30% of small businesses will experience a natural disaster. 10% of small businesses will suffer a data loss caused by human error. When terrorism, natural disaster, or another unexpected event occurs, your business, no matter how small, must have a response in place to mitigate your risk. Whether it’s Hurricane Katrina, a forest fire, cyber terrorism data breach, or even a major utility outage, your firm is at risk of shutting down operations. 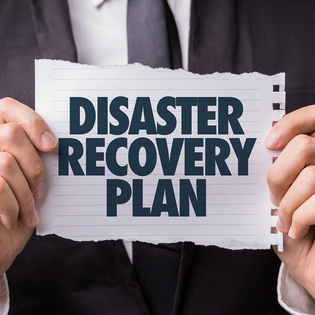 These are all good reasons to consider a disaster recovery plan. Could your law firm survive a data loss? Last year a survey showed that close to 12% of all businesses lack a business continuity plan. For law firms this is critically important; collecting and analyzing evidentiary data is one of the underpinnings of the work of law firms. If that data is lost, the ripple effect could cost you big money. Having a predictable written series of steps and discussing it with staff will help you stay prepared for any eventuality that could hit your firm. For law firms connected to the Internet, cloud computing provides an accessible and affordable option for security-as-a-service models. SaaS is an outsourcing model that allows managed service providers to handle your business continuity plan and overall approach to network security. This is a hugely important resource for the small firm that doesn’t have access to a full-time technology resource. These providers can assist in creating your disaster recovery plan and then help you carry it out with the goal of returning to business as usual as quickly as possible. Cloud computing allows businesses dynamic disaster recovery options which could simply entail regular data backups into the cloud and storing copies of paper files off site. A managed service provider can manage that data and help maintain your network against security breach from hackers. For a law firm, every piece of data is important. Today’s business pace mandates that client data is maintained securely and is completely recoverable even in the case of a catastrophic event. Don’t take a chance, get peace of mind, get a disaster recovery plan.